Shirts With Random Triangles: Texas A&M shows off new renderings of Bright Football Complex renovations. 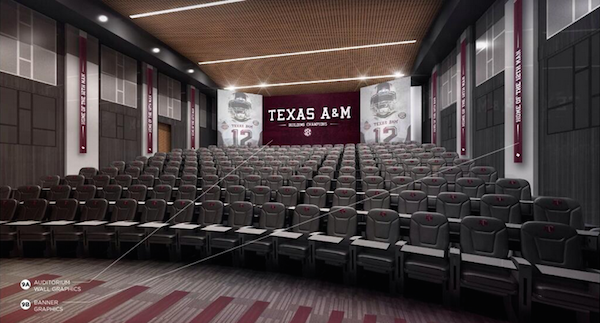 Texas A&M shows off new renderings of Bright Football Complex renovations. Texas A&M has released renderings of renovations to its Bright Football Complex. Work is currently going on in the locker room and training areas, with plans to renovate the third floor office areas after the 2014 season begins. 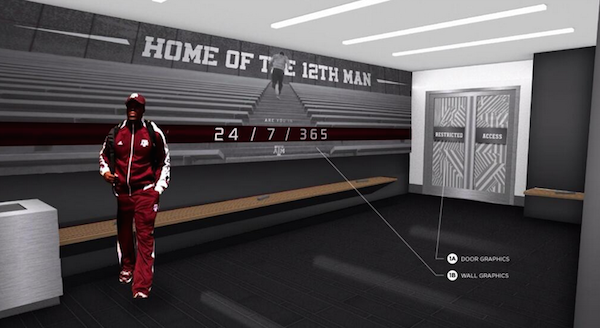 The Bright Complex renovations have the fingerprints of Texas A&M head coach Kevin Sumlin all over them. Sumlin set out early on to place an emphasis on branding on the Aggies athletic facilities. While the newly refurbished Kyle Field may be (at least in spirit) "The House that Johnny (Manziel) Built," Sumlin''s impact on the program will be seen by players and recruiting candidates for years to come. Of course, Texas A&M is making sure that Manziel's impact on the program is remembered in the Bright Complex as well. The emphasis is going to be on the here and now of the program, however. Which is a good thing for a program that's looking to prove the past two seasons of success with Manziel at quarterback were no fluke.